Violence against women and girls is one of the most pervasive manifestations of gender inequality in the Pacific region and the Pacific Community (SPC) has an ongoing responsibility to address this “cancer” in our society. These are the strong sentiments expressed today by the Pacific Community Director-General, Dr Colin Tukuitonga, to staff and guests as the organisation paused to mark the International Day for the Elimination of Violence Against Women and White Ribbon Day at its headquarters in Noumea. “Violence against women is a human rights violation. It’s like a cancer in our society, eating away at progress in many areas of development including eradicating poverty, improving education outcomes and maternal health,” Dr Tukuitonga said. “I trust that through our collective efforts, we will join forces to protect our women and children from all forms of violence, today, over the next 16 days and beyond,” he appealed. Across the Pacific, studies have documented that between 25% and 70% of Pacific women experience physical or sexual violence at some point in their lives, as set out in the report, Beijing +20: Review of progress in implementing the Beijing Platform for Action in Pacific Island Countries and Territories, produced by SPC with the support of UN Women. Such studies have raised awareness at the highest levels of government about the extent of violence against women in Pacific island communities. Staff and guests at SPC’s headquarters in Noumea, New Caledonia, and regional office in Suva, Fiji, today took part in a series of activities and discussions on the prevention of violence against women, and the role employers and colleagues can play in supporting individuals affected. SPC staff located around the region observed a minute’s silence in memory of a former colleague, Losana McGowan, and other women who have tragically suffered as a result of domestic violence. In Suva, SPC’s Economic Development Division Director, Capt. John Hogan also seized the opportunity at the Regional Meeting on Transport to address the issue of violence against women in his opening remarks and encouraged all delegates to wear the white ribbon. 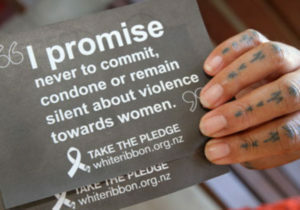 Men can wear a white ribbon as a pledge never to commit, condone or remain silent on violence against women. SPC also took the opportunity to brief staff on its revised policy on prevention of domestic violence which upholds a principle of zero tolerance and establishes clear guidelines on how to support staff in situations of family violence. “Sometimes the workplace is the only place victims feel they can raise what’s going on as they can be cut-off from other avenues. But there’ll always be someone to talk to if you know where to go and that’s a message of reassurance we’re sending to all women and girls in New Caledonia,” the Women Against Conjugale Violence, Isane Vallet, said during the panel discussion at SPC headquarters.